Reveal brighter, clearer skin with our gentle, soap-free face cleanser. Soothing, anti-inflammatory Golden Calendula blossoms, collected every Summer, are blended with a special bouquet of essential oils. Cleansing Sunflower seed oil removes makeup, dirt and other build-up without stripping the skin of its natural moisture. Citrus peel and Rose Geranium oils have a tone-balancing effect thanks to their antibacterial properties, while their uplifting fragrance is a revitalizing aromatherapy treatment. Delicately massage 2 pumps of cleanser onto the face. Remove with a damp washcloth or a splash of water. Recommended for daily use at morning and night, to remove pollutants and makeup. 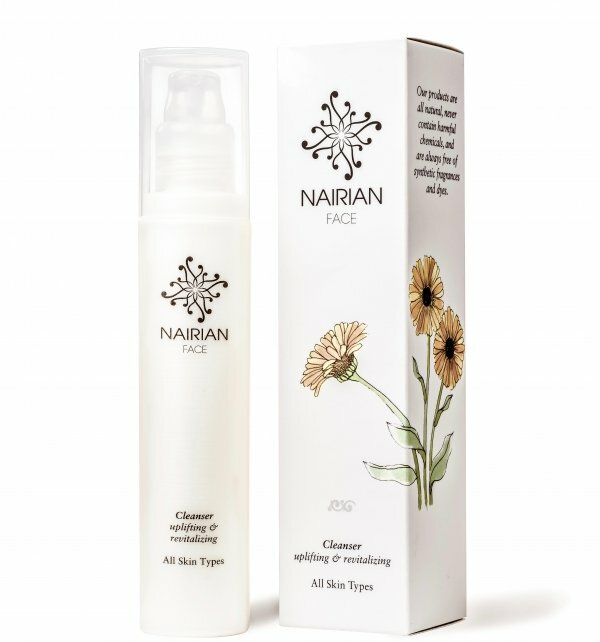 For best results follow with Nairian Toner and Moisturiser. Aqua (Water), Helianthus annuus (Sunflower) Seed Oil, BTMS (Behentrimonium Methosulfate), Calendula officinalis (Calendula) Flower Extract, 1,3-propanediol, Cetearyl Alcohol, Decyl Glucoside, Sodium Levulinate, Sodium Anisate, Sodium Benzoate, Tocopherol, Lactic Acid, Sodium Phytate, Citrus sinensis (Orange) Peel Oil, Citrus paradisi (Grapefruit) Peel Oil, Citrus reticulata (Mandarin) Peel Oil, Citrus limonum (Lemon) Peel Oil, Pelargonium graveolens (Geranium) Leaf Oil, linalool*, citronellol*, limonene*, citral*, geraniol*.